Ahh, it’s time for our end-of-year celebrations. Time for all of our favorite traditions, like family recipes, egg nog, holiday lights, traveling to see family, gift giving, reflection over the last year, and so on. Spending time with family and friends often brings up common questions such as “What are you doing now?” Or maybe if you haven’t seen some people for a while, they don’t even know that you’ve finished college or what you majored in. The holidays give us a chance to get caught up with people and share our news! You might find yourself saying, “I graduated with a degree in civil engineering and now I’m working full-time or studying for my Masters or working on my Ph.D.” But think about this: some of our family and friends may not know just what civil engineering is, especially some of our younger family members! Do you have s nephews, nieces, little brothers or sisters and cousins that you’ll spend time with this year? Why not shed some light on what you do for your career and talk about what you’re proud of. A fantastic idea is to jump on the computer with your family and head to ‘ASCEville’ to show those inquisitive youngsters just what our careers are all about. 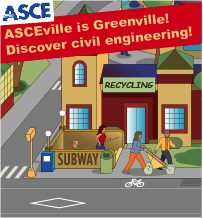 If you haven’t been there, check out ASCEville to see how civil engineers are involved in just about every facet of cities and infrastructure in our world. You can use the site to explain why buildings stand up, how water is cleaned and delivered, what role civil engineers play in transportation, waste management and recycling, bike lanes, wind energy and more! There is a scavenger hunt that is fun for children to do to discover all of these aspects of the city they’re viewing. Help guide them along as they match the items they find in the city to the scavenge list! Each time they correctly answer, additional information about that component of the city is displayed. Ask them if they’ve seen some of these developments in their city. Do they think civil engineers are important to society? The ASCEville site has a vast amount of additional resources. The “Civil What? !” page has examples of the branches of civil engineering with photos of real-life projects. Check out the Explore: Bridges page to show off different types of bridges, historical bridges around the world, challenges and fun facts! There are numerous resources for parents, educators and teachers on age appropriate activities, video tutorials and information on how these activities are helpful for working with the National Science Education Standards. You can point your family and friends to resources on how to pursue a career in engineering and where to start. If your relatives like games, there are a bunch of links to educational games, videos and other activities on the “Just For Fun” page. 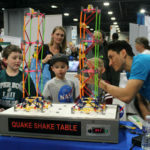 You can design a bridge to withstand an earthquake, test it and see if it survives an earthquake of magnitude of your choice! Wrap up your discussion on civil engineering with some examples of what you’ve worked on in your career. If you have some pictures of your projects, show them off to your family and friends! Maybe you have a plan set to flip through to go along with the pictures. This is sure to impress everyone at the dinner table and provide some fun discussion this season.